Hope you are having a great Tuesday. I decided to join a birdcage swap. It's kind of an ATC (Artist Trading Card) swap. I had so much fun working on these. Just beautiful work Christina. 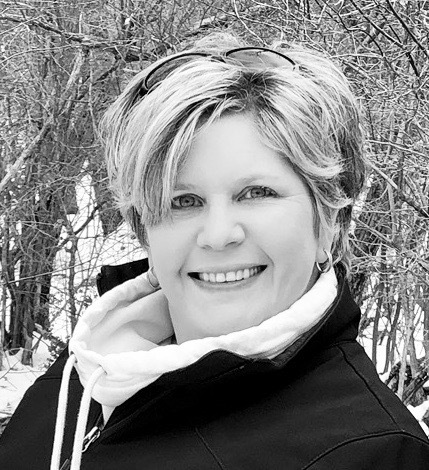 I am so inspired by your projects! That is so beautiful! I was wondering if you would show us how you made the lollipop flower out of ribbon sometime. Thanks for your inspiration! I really like this. You are amazing on all that you make. Love this use of the bird and cage. I'll be playing around with this today! How about a tutorial on your new toy, Distrezz it all-Zutter? Christina your work is beautiful. I love how you end it with saying 'simple', your work is truly inspirational. 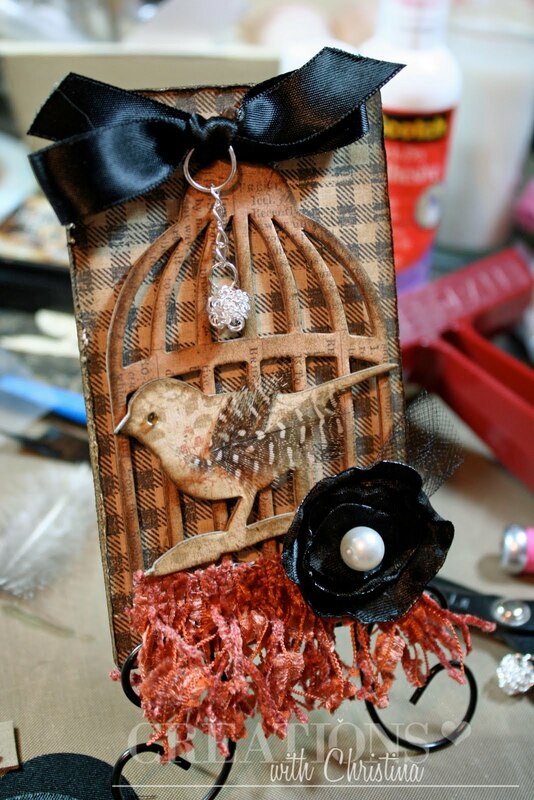 I would love to get that Tim Holtz bird cage die. I haven't found it locally. M, ACM, HL. are the only local stores. I heard a bird chirping as the video was running. Don't know if it was on the video or outside my front door where there is a birdnest and 3 baby birds that found a home in a floral grapevine wreath. Wow, I'm so impressed Christina. Your ATC is just stunning. So many new ideas. I've never heard of the Distrezz it all-Zutter. Show us please. You did a great job on this project. Congrats. Beautiful tag. I'm amazed at how quickly you put it together. love the bird cage/bird it is sooo cute. You have such good ideas. you did such a beautiful job christina.. thanks so much for sharing. 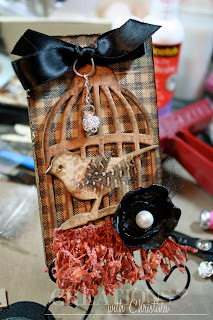 i love how the patterned paper looks so vintage behind the cage.. great job!!!! The pattern paper is the Brenda Walton "Maison" collection. I love that paper! Love the vintage look!!!!! Great die and the paper you used w/it was perfect. Wow, Christina, you sure have the distressed look down to a tee! This ATC is beautiful! Wow it is absolutely stunning, so classy and I love the vintage look to it. You inspire me every time I watch you its as if I could do anything. I would love to learn how to make the lollipop flower with satin huh? :) SO pretty but I am sure prettier in person.